Panama Papers’ Reporters Explain How the Biggest Leak in Data Journalism’s History Materialized | Democracy Now! an investigative reporter at Germany’s leading newspaper, the Munich-based Süddeutsche Zeitung, that helped publish the Panama Papers. He is co-author of the book Panama Papers: The Story of a Worldwide Revelation. senior editor at the International Consortium of Investigative Journalists, which published the Panama Papers. Hundreds of journalists around the world pored over the 11.5 million files leaked last year by an anonymous source that reveal how the rich and powerful in numerous countries use tax havens to hide their wealth. The files were leaked from one of the world’s most secretive offshore companies, Mossack Fonseca, a law firm based in Panama. They were obtained from an anonymous source by the German newspaper Süddeutsche Zeitung, who shared them with the International Consortium of Investigative Journalists. 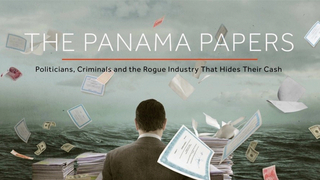 We hear the story of the collaboration, which did not include The New York Times, from Frederik Obermaier, an investigative reporter at Süddeutsche Zeitung, which helped publish the Panama Papers, and Michael Hudson, senior editor at the International Consortium of Investigative Journalists. AMY GOODMAN: I’m afraid we might lose Frederik Obermaier, who’s in a studio in Münich, Germany. So, before we do, as a leader of this whole effort analyzing over the last year this massive number of files, information from this Panamanian law firm, talk about where you’re going with this from now—I mean, there are so many stories—what you’re following. And, of course, the book Panama Papers was just released in Germany today, Frederik. FREDERIK OBERMAIER: For us, the last two days were just the beginning. I mean, there will be—for example, at Süddeutsche Zeitung, we are going to publish or are planning publications nearly every day now for the next two and three weeks, and then we will go on in a regular basis. And there are still great stories and revelations to come out in the next days. So I would—I would recommend: Stay tuned with ICIJ. AMY GOODMAN: And what have you been most surprised by, Frederik, in all of your work with this? What do you think are the stories that could topple governments? FREDERIK OBERMAIER: I think, for me, it was very important to realize that it’s not only governments of autocratic regime kleptocrats being in the data, but that at the same time it’s Western—or leaders of Western governments being in the data, like the Icelandic prime minister. And furthermore, for me, it’s like we are always—at least in Germany, we speak about tax havens in the context of taxes and tax minimization and tax evasion. But, for me, the Panama Papers data show that it’s not only about taxes. It’s about criminals hiding their wrongdoings. It’s about sanctioned people trying to go on with their business although they are sanctioned. And it’s—I think this is the reason why this topic should matter all of us, because there are so many aspects where we are concerned with this topic of offshore companies and tax havens, because they—this is a completely parallel world. It’s a secret offshore world, and we should, I think, shed some light into this world. AMY GOODMAN: And, Michael Hudson, on the issue of Ponzi schemes in the United States? MICHAEL HUDSON: Yes. We haven’t reported on those yet, but we do have—you know, the thing you have to remember is, any time there is a major fraud case—Madoff, any of those kind of cases—there will be an offshore element. When the money is so large, when the schemes are so big, you need offshore to help cover your tracks and help hide the loot. And we do have—we don’t have Madoff-level Ponzi schemers or—you know, his Ponzi scheme was the biggest of all time—but we do have fraudsters based in America who have been doing business with this law firm, and we will be reporting on down the road. MICHAEL HUDSON: Right. Yeah, it’s very interesting. You know, the United States has taken a role and seems, in many ways, to be working at cross purposes. The U.S. Justice Department has gone after Swiss banks in a big way, gotten huge settlements with some of the biggest banks, and even some of the smaller Swiss banks, and put pressure, but there are many other examples of the United States either having policies which encourage money being moved around secretly or where we’re turning a blind eye. You know, there are states like Delaware and Nevada where there’s just as much secrecy, just as much privacy; if you want to get a company, if you want to have a shell company and not have your name publicly attached to it, you can do that. AMY GOODMAN: If we haven’t lost him yet, Frederik Obermaier in Münich, a new headline in The Wall Street Journal, “India Launches Probe After 'Panama Papers' Reports.” The Indian finance minister said New Delhi will set up a multi-agency panel to examine each of the people named in the report. How prominent is India in this wave of documents? FREDERIK OBERMAIER: India turns up in the context of dozens of very, very interesting cases, for example, where our colleague, Ritu Sarin, specialized on. And what she found that was amazing, it was tracks leading to prominent politicians. But I don’t want to tell too much, because I don’t know or haven’t followed her reporting that closely that I would know which she already had reported and which not, so I’m sorry for that. AMY GOODMAN: Well, finally, Michael Hudson, what does this mean for international collaborative journalism? I mean, how many journalists, how many newspapers worked on these documents that have been revealed over the last year? The New York Times said they didn’t even know that this was being worked on. Interesting, public editor wrote a piece, like why aren’t they doing more on this, why aren’t they featuring this. Well, they weren’t included in this. And they said they’re looking into it now. MICHAEL HUDSON: Right. More than a hundred news organizations from more than 70 countries have worked on this. AMY GOODMAN: For how long? MICHAEL HUDSON: For—most of them for more than a year. You know, we’ve been doing these collaborative projects for a long time. We were talking in terms of dozens of people involved in earlier projects. This current project, more than 370 journalists around the world. And as I said, it’s all about people realizing that the more you give, the more you share with your fellow journalists, with your colleagues, the more you’re going to get back in the end, and that you don’t have to—you know, the sort of cutthroat competition that often characterizes journalism, that doesn’t have to be the way forward. AMY GOODMAN: And any indications on whether there are multiple sources here, Frederik Obermaier? Is it just one? And the story behind getting the actual—physically getting these documents, these files? FREDERIK OBERMAIER: I would rather not comment on that, because we want to protect our source, so I hope you understand that we will not—that I cannot answer this question into detail. AMY GOODMAN: OK, we’ll leave it there, but of course continue to cover these stories as they roll in. Frederik Obermaier, speaking to us from Münich, Germany, his newspaper—he’s an investigative reporter in—with Germany’s leading newspaper, the Münich-based Süddeutsche Zeitung, a co-author of Panama Papers: The Story of a Worldwide Revelation, just released today in Germany. And thanks so much to Michael Hudson, the senior editor at International Consortium of Investigative Journalists, or ICIJ, which published the Panama Papers. And we’ll link to everything we see as it unfolds and as it comes out at democracynow.org. We’ll be back in a minute.